When should I retrofit from R-12 to R-134a? Recharging an R-12 system has become price prohibitive. If your old R-12 system needs repairs or has lost refrigerant, the timing could be right for you to convert your system from R-12 to R-134a using one of our retrofit kits. Which kind of oil should I use for retrofitting? Please click here to view the R-134a oil specs by vehicle make. The fittings in the retrofit kit are aluminum. Would steel be better? No. There are two reasons for choosing aluminum. Firstly, the service port that the valve is being screwed onto is made of aluminum. If you are putting steel on an aluminum port, you run a greater risk of stripping the port, a costly repair. Secondly, different metals expand and contract at different temperatures. By using different metals, there is a greater risk of leakage due to weather-related expansion and contraction. What is the difference between an “open system retrofit” and a “closed system retrofit”? 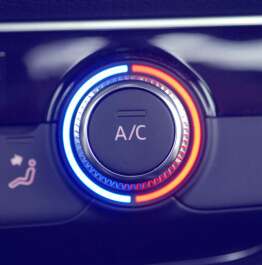 An open system retrofit is when the air conditioner system is opened, allowing air to enter the system. This is necessary if there are to be any repairs made at the time the retrofit is performed. Once the system is opened, the accumulator or filter/drier should be replaced and a vacuum pulled before adding the refrigerant. A closed system retrofit is made when no repairs are necessary and the air conditioner is not opened. Following the EPA procedures, the R-12 refrigerant is removed (it must be reclaimed), and new oil, fittings, R-134a refrigerant, and a label are added. What are the steps for an R-12 to R-134a retrofit? Check out this video "How to Retrofit a System". What happens to the mineral oil in an R-12 system when R-134a is added? Since the refrigerant carries the lubricant throughout the system, the oil must be soluble with the refrigerant or it will remain in the bottom of the air conditioner. There are two recommended oils, polyalkylene glycol (PAG) and polyol ester (Ester). Both are soluble in R-134a, either will give acceptable lubrication, and both are also compatible with the existing mineral oil. Does the original mineral oil need to be removed when doing an R-12 to R-134a retrofit? No. The mineral oil in an R-12 system is compatible with either PAG or Ester oil. The original equipment manufacturers have chosen to outfit all new R-134a vehicles with PAG oil. Therefore, since PAG oil is the new OEM standard, our Retrofit kits use PAG oil. These additives enable the system to use the existing mineral oil. Should I flush the A/C system before completing an R-12 to R-134a retrofit? No. It is not necessary to flush before retrofitting. The decision on whether or not to flush should be made on other mechanical requirements (i.e., compressor failure, contamination, etc. ), not on retrofitting. Do I need to remove any remaining mineral oil when I retrofit my R-12 vehicle? No. Our retrofit kit contains special conversion additives that allow the existing mineral oil to be compatible with the R-134a and PAG oil, so it does not need to be removed. You can see all of our retrofit products here. Can I add R-134a directly to my R-12 system? No. Federal law prohibits topping off an R-12 system with a different refrigerant.